Chateau de La Riviere is one of the older estates in the Fronsac appellation. The history of the property can be dated back all the way back to 769, when the Emperor Charlemagne ordered that a fort be constructed on the site, Prior to 769, the land was previously used by the ancient Romans as a burial mound. The chateau in use today was constructed in 1577 by the mayor of Bordeaux, Gaston de L’Isle. Before La Riviere was sold, the estate had been owned by the L’Isle family for more than 500 years! Chateau La Riviere takes its name fittingly from the Dordogne river that sweeps through the Fronsac region. The estate was owned and managed by James Gregoire until 2013. 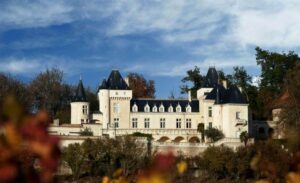 Chateau de la Riviere is the largest estate in the appellation of Fronsac, with close to 59 hectoliters of planted vines. However, the estate also includes beautiful gardens and forest land, bringing the total size of the property up to 65 hectares. Here you also find an impressive array of underground limestone quarries, which provide perfect storage conditions for their wines. Chateau de la Riviere has enjoyed periodic renovations over the years. In 1962, the Right Bank estate was completely modernized. But not for the last time. Chateau de la Riviere was purchased in 1995 by Jean Leprince who once again modernized the estate. Tragically, Jean Leprince was killed in a flying accident in 2002. Following his death, the property was sold to James Edmond Gregoire. James Gregoire earned his wealth as one of the top manufacturers of grape harvesting machines. In a tragic twist of fate, James Gregoire also died in a flying accident. He was killed when his helicopter crashed in December 2013. Sadly, the accident took place only one day after James Gregoire agreed to sell Chateau de la Riviere to the Chinese billionaire Lam Kok. 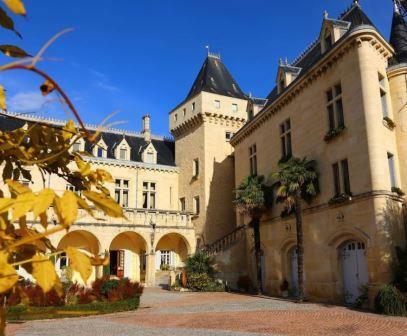 This deal was said to be the largest investment by an Asian yet in a Bordeaux vineyard, surpassing the deal for Chateau Bon Pasteur earlier that same year! The buyer, Lam Kok was also in the helicopter and died in the same accident. The group was said to have been flying over the Right Bank vineyard surveying the land when the accident took place. The children of James Gregorie purchased Chateau Ripeau in St. Emilion the following year. The large, 65 hectare vineyard of Chateau de La Riviere is planted to 82% Merlot, 13% Cabernet Sauvignon, 4% Cabernet Franc and 1% old vine Malbec in 53 separate parcels on clay, limestone and sandy soils. This shows a marked increase in the plantings of Cabernet Sauvignon. The vineyards have old vines, some of which are up to 80 years old. Chateau la de Riviere takes a serious environmental approach to their vineyard management techniques. In 2012, they became one of the first Bordeaux chateaux to earn certification for high, environmental value. The red wine of Chateau de la Riviere is fermented in temperature controlled stainless steel vats and aged in 30% new French oak for between 12 to 18 months, depending on the character and style of the vintage. In addition to the red wine of Chateau de La Riviere, the estate produces a white wine, Chateau de La Riviere Blanc from a unique blend of 67% Sauvignon Blanc and 33% Sauvignon Gris. What makes that blend unusual is the extremely high portion of Sauvignon Gris. The white wine is vinified in cement vats. Chateau de La Riviere also makes a special, luxury cuvee, Aria. Aria is a small production wine made from a Merlot dominated blend that comes from some of the estate’s oldest Merlot vines in a single 1.5 hectare plot. This is a much richer style of wine that sees a lot more new oak. In fact’ it’s aged in 100% new, French oak barrels. Close to 1,000 cases of Aria are produced each vintage. Like all the wines of Chateau La Riviere, Michel Rolland is the consulting winemaker. Production of La Riviere ranges from 15,000 to 18,000 cases of Bordeaux wine per year. They also make a second wine, Les Source Chateau de La Riviere. Chateau La Riviere is much better with at least 2-4 years of aging in good vintages. Young vintages can be decanted for 1 hour or so, allowing the wine to soften and open its perfume. Older vintages might need very little decanting, just enough to remove the sediment. Chateau La Riviere offers its best drinking and should reach peak maturity between 3-12 years of age after the vintage. Chateau de La Riviere is best served at 15.5 degrees Celsius, 60 degrees Fahrenheit. The cool, almost cellar temperature gives the wine more freshness and lift. Chateau de La Riviere is best paired with all types of classic meat dishes, veal, pork, beef, lamb, duck, game, roast chicken, roasted, braised and grilled dishes. Chateau de La Riviere is also good when matched with Asian dishes, rich fish courses like tuna, mushrooms and pasta. Chateau La Riviere is more than just a winery, the estate is also a full service hotel in the Fronsac appellation, which offers guests luxury and the opportunity to enjoy life in the middle of their Right Bank vineyards. The wine easily shows its oaky side along with its chocolate and plummy character. Medium bodied, round, lush and juicy, this will clearly offer pleasure on release. Forward, fun and easy to drink, this is a crowd pleasing styled wine that will drink well early. Forward, soft, polished, ripe and packed with, sweet, plush, dark red fruits, this will drink well on release. Fresh, juicy, round, forward and offering loads of ripe black cherry licorice, smoke and earthy characteristics. Even at this young stage, this is already quite tasty and easy to drink. With a few years, this could be even better as it fills out and gains more weight. Licorice, smoky cherries and earthy notes on the nose, lead to a sweet, open, fresh plummy wine. This delicious, Merlot based wine is filled with ripe, juicy, dark berries, chocoalte, cherry, minerality and vanilla. Supple in texture, concentrated, fleshy and plummy, the wine is already drinking well now. It's hard to find in America at the moment, but if you run across a bottle, it's worth tasting. Fully ready to drink, the wine is filled with round textures, licorice, espresso bean, plum and cherries. This is not for aging. It's for drinking. Jammy black fruit, licorice and coffee aromas, soft textures, medium body with a plum and herb filled finish. I'd drink this on the young side. Fully mature, round, flashy, espresso, dark, plum, licorice and black cherry filled wine with sweetness to the chocolatey fruit and a touch of oak that remains in the finish. This is not a wine to hold for further development.